Duinhir of Morthond MZ630 Mithril figure. I do like the figure regardless of how it was created, but if I am honest, I cannot see the increased 'sharpness' in detail that Michael O'Brien mentions, however there appears to be no drop in quality as far as I am concerned, and if I didn't know this was a Zbrush figure I doubt I would have been any the wiser. I have no complaint with this new 'format'. Maybe Michael is comparing a non-undercoated casting, and maybe a member with younger eyes will see the difference more clearly, comments welcome. If it means an increase in releases and more subjects then carry on . I see Barli, Holger and Dave D here at one time with me!! Drinks all around! Thanks Master twrich! Much appreciated! Come on Master Barliman, what drink is this?? There is no bloody rat tail in it!! The feeling about this figure is not the same as for hand sculpted, especially the cape and the face. My eys are even better, Master Tree- therefore I didn´t order that miniature at all. Also the reason why I won´t take part into that painting competition. Did you not want the figure or where you just not interested in that particular design? @ Master mindx: I am not interesting in that particular design and therefore I don´t want that figure. For my taste, the figure has got nothing particulary. 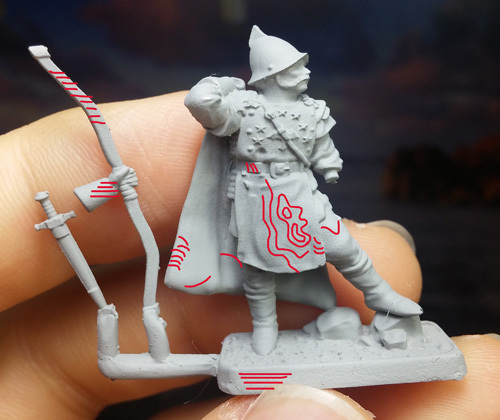 As far as the "new 3D-printer-thing is concerned I have to say, that my Easterling Champion, which is already ready for receiving some paint- is brilliant. But as Master Thingol pointed out- no more special detail than the regular formed figures. and why is the bow that thick? I got quite discouraged and disappointed. No way an enterprise can spend that long time to end up in an inferior quality product. Even without stripping the primer out it's quite evident. I will put some pictures here for you to see what I am talking, then you could check your own models and see. 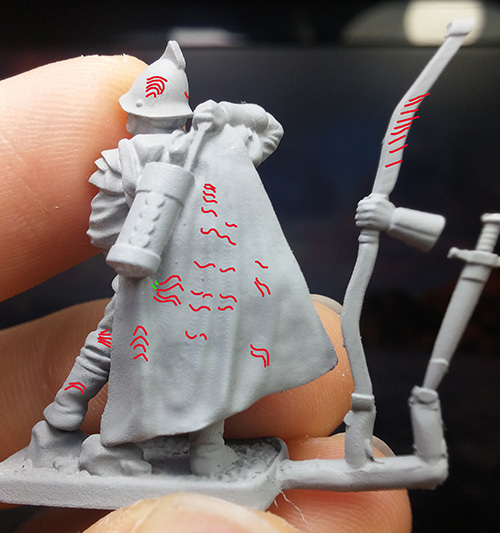 Also all the model got a general effect of being a bit slanted to a side, that explains the thickness of the neck, the head and the bow I think. @Theobald: the folds above the quiver are produced by the quiver's "belt" but it's almost invisible up there. Ahhhhh----- the right decision NOT to buy that figure! As far as my eyes are concerned, the figure is in no way anything different from what we've seen in the past, neither better nor worse. There have been earlier figures that could occasionally be said to be "sloppy" and nothing particularly special, but that will inevitably be the case from time to time. No one can be eternally perfect. And remember, this is one of The Man's first figures designed this way. We all learn and improve from experience! Personally I can't level any particular criticism at it, and, as has been said elsewhere, it it gets the backlog of Fellowship figures clerared that has to be a positive step. And remember, this is one of The Man's first figures designed this way. It's in fact it's fourth designed this way, but the FIRST with it's master printed. (If I did understand all the messages and "excuses" that the company has shared publicly). And we are talking of a professional miniature company not a group of guys that just joined now. I have miniatures from other brands with their master printed in the same way and with the same program that are by far superior. Those brands did not spend almost three years developing a product nor sell it for this price. That's the reason why I posted on their forum the same images that I posted here, I will not admit a diminish in quality, even if its a "minor" issue that only sharp eyes can appreciate. Moreover if they do not solve the issue (though I hope they will solve it) I will end up, stopping my buys and starting to sell.